◼ A BUZZING REUNION OF OLD ROMANTICS partied hard last night in memory of the inspirational host of the 80s Blitz Club Steve Strange, who died suddenly last February. He would have been proud of the gathering at London’s Club Café Royal last night, organised by his close friends Rosemary Turner, Amanda Lloyd and Steve Mahoney. 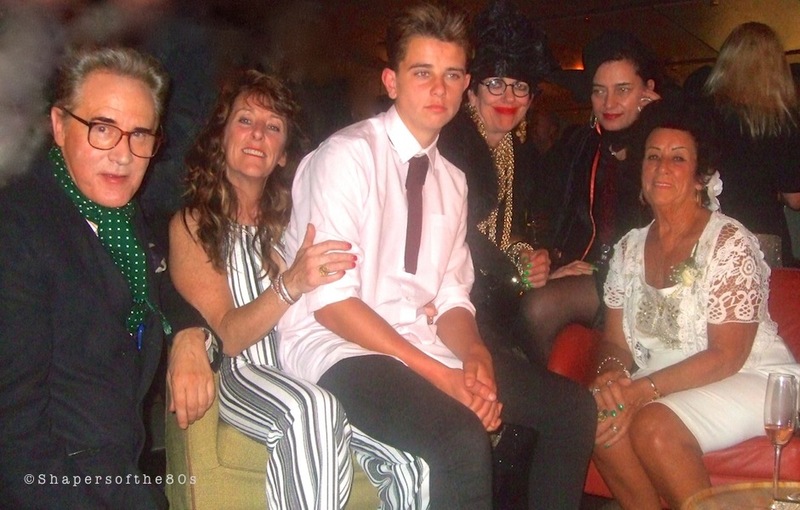 Along with Amanda, Steve’s mother Gill and sister Tanya Harrington have created a charity called the Steve Strange Collective to sustain his legacy as style icon, popstar and one of the key shapers of the 80s. This celebration of Britain’s New Romantic heyday was the first of their projects. The most impressive turnout last night came from the St Martin’s Massive ’78-84, a galaxy of original Blitz Club regulars whose attitude and talent ignited a new pop culture that became the Swinging 80s. Significant absentees included those living abroad or currently on the road with their still-active acts, such as Rusty Egan, Culture Club and Spandau Ballet. The champagne party warmed up with a series of Steve’s admirers providing intermittent entertainment, opening with poet Celine Hispache. As Two Blondes and a Harp, former Shock dancer Lowri-Ann Richards in leather jacket and her accompanist Glenda Clwyd gave us a Berlinesque rendering of Visage’s Pleasure Boys. Cabaret chantoose Eve Ferret shimmied in a full-length black peignoir before the Harrington family, first setting fashionistas Stephen Jones and Fiona Dealey a-boogeying before animating her number All Ze French I Know by scattering mangetouts o’er the guests. Eve reminded us how Steve became the nucleus around whom a generation of like-minded spirits came to express themselves. For her the night became more special when she was reunited with her onetime partner James Biddlecombe of their act Biddie and Eve which was a backbone of the Blitz wine bar’s cabaret programme. Later Romance vocalist Jamie Lovatt reminded us of his near triumph on The Voice TV talent show, and electro-swing deejay Lee Being gave us Love Croaks. Finally came the loyal friends who joined with Steve in recent years to revive the 80s clubbing spirit with their Face club-nights, Camden Palace doyenne Rosemary Turner and new-generation deejay Alejandro Gocast. He hushed the guests gently and reminded us with intense poignancy of Steve’s giant influence on possibly every single person in the room tonight. Another giant figure quietly circulating the party was style guru Peter York, who in this context we could dub the Anna Wintour of subcultural commentators, having documented all manner of British tribes from Sloane Rangers to his unique discovery, Them, in his landmark book Style Wars. Back in the day, York claimed that Steve’s Blitz club created “a powerful mix of magpie retro, fastidious taste and market exploitation, tailor-made for what they were calling the art form of the 80s”. Last night, he was charm itself, evidently wowed to meet the Harrington family. The evening’s music was absolutely on fleek. While David Holah resurrected the fabulous Blitz Jive amid some hefty dancing to good old Romo tunes from Roxy and Japan and Bowie, spinning the platters was a sequence of deejays from Lee Being, Dennis Da Silva, Alejandro Gocast, Steven John Proctor to Little Andy. In no particular order here are few of the guests we recognised at the Club Café Royal celebration, with apologies to many more whose names we hope to add once they become known. . .